I've been hunting with the 9.3x62 calibre for years. I appreciate its reliable effectiveness against all game found in these parts, from roe deer to boar and red deer. The only disadvantages were the curved trajectory and the powerful recoil. A V0 of over 1000 m/s, an optimum penetration range of 200 m and a range of approx. 250 m.
These are values that are otherwise achieved only with dedicated long-range cartridges. And by the way, these data were measured by the government ballistics centre in Mellrichstadt, so we can depend on their reliability. So I loaded, as specified: 10 g KJG bullet, 65.4 gr RS40, L6 81.5 mm and went out to the shooting range. I was impressed by the mild recoil, the superior precision, the clean combustion and the minimal muzzle flash from the short (45 cm) barrel of my 98. I subsequently took down several boars while hunting, and was always extremely satisfied with the effect. So it's only to be expected that I was keen to try out this new handload on my next hunting trip to Namibia, particularly as I knew that you sometimes need to take extremely long shots out there. "If only that would happen every time." The second experience was even more spectacular. I desperately wanted to bag an eland. This is the strongest antelope there is. And to get ahead of myself, the bull weighed 900 kg – the size of a powerful Cape buffalo. 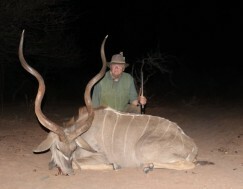 A report in the most recent issue of the hunting magazine Jagen Weltweit impressively described hunting a powerful eland using a .375 Holland & Holland. In that hunt, three shots from this large-calibre rifle were necessary, and the wounded animal had to be trailed for several hundred meters. We wanted to set up at a water hole, but unfortunately the wind was unfavourable, so sitting in wait atop the 6 m high raised hide was simply not an option. So we were left with the more uncomfortable alternative and set ourselves on camping stools around 70 m the other side. There, the wind blew directly across the water hole toward us. First, 12 giraffes came by, including a capital bull. You cannot believe how cautiously these animals move in the wild. The herd approached the water hole step by step, warily watching the entire way. As a final measure, the bull stuck its head down into the raised hide (around 6 m high) to make sure there was no one there. Only then did they begin to drink. Just seeing this made my trip to Namibia worthwhile. But then we heard a clicking, first far away, then approaching ever closer. Because of the animals' great weight, the hooves of large eland bulls are so worn down that when the animals raise their legs, the hooves strike together, making this clicking sound. The bull at first only stuck its head through the bush, and simply waited "forever". Then he stepped out, but turned away so that we could only see the rear legs from behind. Then he stood behind a giraffe. And then he stood so that a safe shot that did not endanger one of the giraffes was not possible. I felt myself becoming more and more restless, while my rifle got heavier and heavier. I could only shoot through a tiny hole that we had cut in the bush in front of us. This position was extremely difficult. Suddenly the bull was standing broadside in front of me. At first I was completely disoriented, because his huge dewlap was wobbling in my scope, so that I hadn't a clue where to aim. Then I told myself, Do it just like at home, sight clean on the shoulder blade, don't get excited, squeeze the trigger slowly and evenly, don't jerk! I was startled when the shot went off without my consciously intending it. Which is how it should be. While the giraffes looked in amazement in all directions, the eland bull responded clearly to the hit and, severely wounded, took flight directly at our hide. His flight slowed steadily until he came to a halt 15m in front of us, breathing heavily. After an interval which felt like an eternity, but could not have been more than a few seconds, he slowly lowered his head, first just a few centimetres, then a little more; then he knelt on his forelegs, lay on his side and died, without jerking even once more. The bullet penetrated the bones of the upper arm both on entry and exit and lodged under the hide on the exit side, so that I could recover bullet fragments. Conclusion: If we look at the load data in the new product catalogue of Sax Munitions GmbH, we find that the RS40 powder is consistently the top performer in some calibres, such as .308., 8x57, 9.3x62 and 9.3x64 achieves noticeably better performance than all other powders. I am so enthusiastic about this combination that I'm determined to use this load the next time I go buffalo hunting. My guide confirmed that this handload is entirely sufficient for hunting this powerful game, and that it is permitted by law as well.